Even small appliances like an electric toothbrush contain around 40 small components produced using multi-tier supplier networks, with dozens of sites spanning the entire globe. 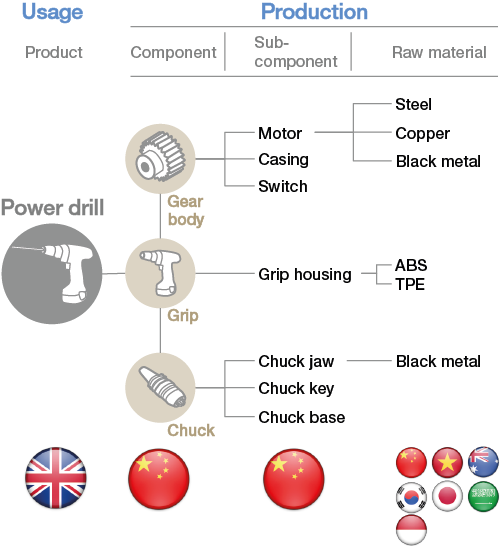 A more complex power tool from B&Q/Kingfisher is assembled from up to 80 components in a three-tier supplier system comprising more than 14 raw materials, extending across different geographies [Figure 13].52 The rise of globalization and product modulation has created global economic growth by maximizing the economic arbitrage of materials and production costs. However, the loop for each of the components, sub-components and materials should eventually be closed. Geographic dispersion will need to be examined at very granular levels to close the loops because of how very spread out the different activities are along the value chain. All the arbitrage opportunities and models described in the previous chapters are based on an implicit set of assumptions: that materials, components or product loops can be closed, both physically and in terms of quality, to create a balanced materials flow at a steady state. Successful and profitable examples do exist at a company level. 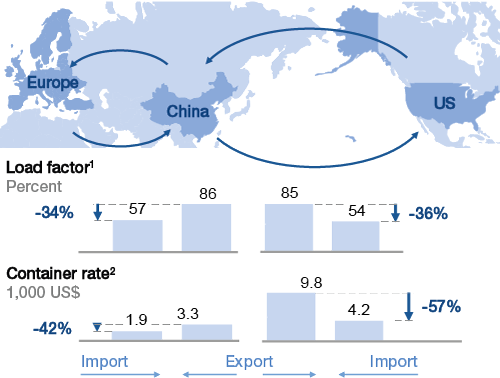 But at a global level, supply chain setups are increasingly complex and fragile. This is the result of the world’s ever growing global trade volume and value,53 as well as the shift of manufacturing from industrialized countries to emerging economies has created increasingly complex and fragile supply chain setups. In the interviews the team conducted for this report, geographic dispersion was one of the most frequently cited points of leakage, and one of the hardest to overcome. So what are the options for systematically identifying leakage points? To be able to make some broad observations across the myriad of supply chains that make up our global, trade-based economy today, it is helpful to simplify the discussion by examining a few archetypes based on the concept of geography. Because in a circular economy, geography matters. As in nature, the archetypes underlying our trade interactions are stunningly uniform. The value of products whose first use cycle has expired is still subject to distance and transport costs at present. Across the industries analysed so far, this study identified—in addition to the typical linear supply chain—three other archetypes of circular or partly circular supply chain setups. These will be termed loops, as products ideally circle back after end of use [Figure 14]. 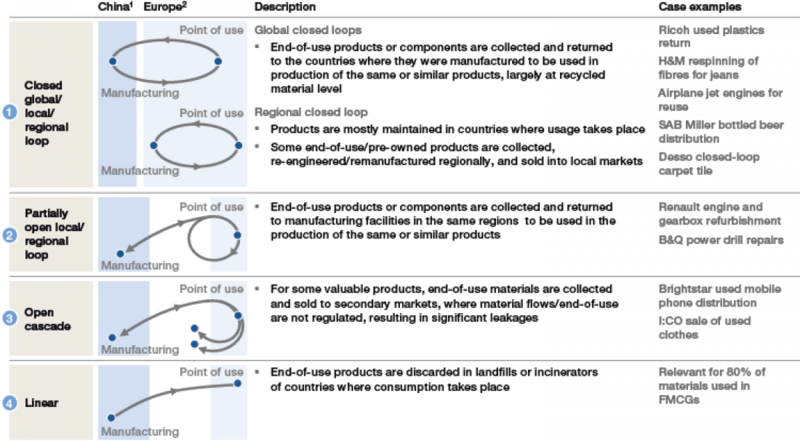 Each category of materials loop has its own types of leakage points, and therefore calls for different enablers to capture the arbitrage opportunities to close it. These archetypes can later be used to provide a search and prioritization approach for identifying how to turn these leakage points into circular arbitrage opportunities. Closed geographical supply loops benefit from large quantities of material and components being returned from their point of use to the point of manufacture to reduce the amount of virgin material or component input required. Construction materials represent further potential for closed regional and local loops. These are generally manufactured and used locally or regionally. Leighton Holdings, a large Australian company that is partially focused on construction, procures raw materials for their pre-fabricated (precast) concrete from Asia (e.g. from China, Japan, Thailand and the Philippines), manufactures the products, and then uses them in those regions.56 Options for closing the loop include local reuse of end-of-use precasts or functional recycling of the raw materials, such as steel and concrete, in new products. This would allow the company to reduce the amount of new raw materials required. 1 Load factor is the ratio between cargo demand and available capacity. The economics of such arbitrage opportunities are expected to improve as the cost of raw materials increases, alongside the efficiency of ocean transport and logistics systems (driven by economies of scale). However, good standards for materials reuse need global support. The global regulatory and customs contexts are a case in point. For example, China has ratified the Basel Convention and banned the import of all e-waste either for direct reuse or recycling.61 Other regions/countries, including the EU and Japan—also parties to the Basel Convention—ban exports of e-waste, too. However, large volumes of e-waste still move from the US, EU, Japan and other countries to China via various routes (Hong Kong still allows the import of second-hand EEE and e-waste with an import license, for example).62 In 2010, the total volume of e-waste imported to China was estimated at between 9 – 11 million tonnes.63 The illegal trading of e-waste makes it very difficult to track materials flows and maximize materials recovery. Partially open geographical loops have a supply chain that is partially linear (from raw materials extraction to manufacturing of the finished product, for example), followed by regional or local closed loops for maintenance and refurbishment, or the harvesting of local components. Good examples can be found for technical products. Renault, for instance, has established regional remanufacturing plants for their gearboxes and engines, in which components are remanufactured, and then integrated back into refurbished gearboxes and engines. Many of these components are originally produced in a multi-tier linear manufacturing network: their footprint has increasingly shifted to Asia. This hybrid of a linear and circular business model already generates attractive, circular arbitrage opportunities. At their Choisy plant, Renault reuses 43% of the carcasses, while 48% are recycled in the company’s foundries to produce new parts, and the remaining 9% are valorized in treatment centres.64 Caterpillar, Ricoh and Canon operate similar partial supply loops, in which products are manufactured across global supplier networks and then maintained, repaired, refurbished and redistributed locally for the respective local markets.65 The circular benefits of this stem from the prolonged use of materials and products and the offsetting of virgin materials input and embedded energy, labour and capital expenditure. Companies around the world are waking up to the opportunities of the end-of-use product trade. One example is Brightstar Corporation, a US-based company founded in 1997 that offers specialized global wireless distribution and services, including buy-back and trade-in solutions for mobile devices.69 Their consolidated revenues increased by 11.4% from US$ 5.7 billion in 2011 to US$ 6.3 billion in 2012, outpacing the industry’s growth. Similar cascades across different products—from trousers to furniture fillings to insulation materials, for example—are also organized across geographies, frequently from the northern to the southern hemisphere. While these cascades prolong product utility at a global level, offsetting the input of virgin materials, they also destabilize materials streams and cause leakages from global or local loops. This is mostly because the net-importing regions for cascaded goods—including many developing countries—have not yet fully implemented international conventions or established uniform regulations on the re-entry of products and components into global recycling loops. In many developing countries, including China, India and Brazil, the collection and recycling of valuable end-of-use materials are often driven by the informal sector. This results in inefficient reprocessing, as well as health and safety hazards for the workers involved. In China, for instance, the formal sector is well integrated and yet only covers around 20% of the e-waste (WEEE) collected.70 The formal sector could extract more value from the same piece of e-waste than their informal counterparts; this could be improved further if the products themselves were designed with resource recovery in mind. In the garments sector, Switzerland-based I:CO is working on revalorizing pre-owned garments by cascading them into Sub-Saharan Africa and building up collection schemes to capture end-of-use streams. However, I:CO faces initial challenges due to the lack of formalized collection schemes.71 Therefore, up to now, large amount of materials that could serve as feedstock for global recycling loops is still lost. 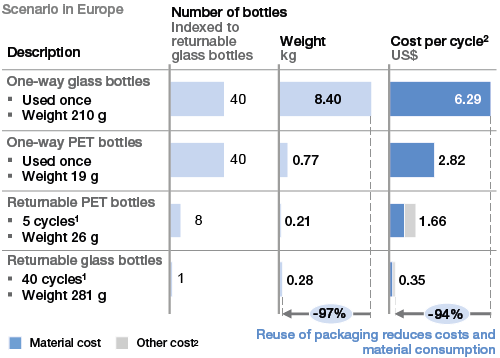 Which pattern will win in the circular economy? 52 Data provided by B&Q/Kingfisher. 53 Trade in global resources, for example, more than tripled between 2000 and 2010, from less than US$ 1.5 trillion to nearly US$ 5 trillion. See Chatham House (Bernice Lee et al. ), Resources Futures, December 2012, p. 4. 54 Interviews with Andre Fourie, SAB Head of Sustainable Development, and Andy Wales, SVP of Sustainable Development at SABMiller. Ellen MacArthur Foundation circular economy team. 55 Interview with Alexander Collot d’Escury, CEO, Anette Timmer-Larsen, Director Marketing, Communications & C2C, Rudi Daelmans, Director of Sustainability, and Willem Stas, Director of Operations at Desso. 56 Interview with Ralf Dicke, General Manager of Corporate Strategy and Patrick Brothers Executive General Manager, Strategy, at Leighton Holdings. 58 Interviews with Philip Hawkins, Assistant General Manager—Business Strategy SCM1, Ricoh UK, and Olivier Vriesendorp, Director of Product Marketing Centre, Ricoh Europe. 59 A tonne of virgin PP pellet costs US$ 2,400, while outbound shipping costs from the EU to China are around US$ 54 per tonne (US$ 1,070 for a 40-foot container holding 20 tonnes; prime recycled PP pellets cost US$ 1,650 per tonne, resulting in a materials cost saving of 30%). 60 Interview with a H&M jeans supplier. 61 Bradford, M., “The United States, China & the Basel Convention on the Transboundary Movements of Hazardous Wastes and their Disposal”, Fordham Environmental Law Review, 2011. 62 eWaste in China—A Country Report, April 2013, StEP Green Paper Series. Can be downloaded from listings (http://www.step-initiative.org/index.php/Publications.html). 64 The Circular Economy Applied to the Automotive Industry, July 2013, Ellen MacArthur Foundation. 65 Towards the Circular Economy 1, January 2012, Ellen MacArthur Foundation. Canon’s website: “Canon responds to customer demand with a new range of remanufactured MFDs”, 8 May 2013 (http://www.canon.co.uk/About_Us/Press_Centre/Press_Releases/Business_Solutions_News/1H13/new_range_remanufactured_MFDs.aspx). 66 European Commission’s Recycling Textile project (http://ec.europa.eu/research/growth/gcc/projects/recycling-textiles.html); Council for Textile Recycling. 68 Used Electronic Products: An Examination of US Exports,2013, United States International Trade Commission. 69 Interviews with Jesus Lebena, Vice President, Latin America Supply Chain & Operations, and Maria Menacho, Chief of Staff at Brightstar Corp.
71 Interview with Paul Doertenbach, Global Account Manager of I:CO.
72 Textile & Apparel Compendium, 2012, Technopak. 73 Towards the Circular Economy 2, January 2013, Ellen MacArthur Foundation. 74 Buildings and Their Impact on the Environment: A Statistical Summary, revised 22 April 2009, US EPA. 75 Based on current 20-ft container price of US$ 1,920 from EU to China, which could transport about 30 tonnes of scrap paper, from Drewry Container Freight Insight, July and May 2013. 77 Reyes, E., “World’s Largest, Most Eco-Friendly Ship Embarks on Maiden Voyage”, Eco-Business, 29 July 2013 (http://eco-business.cmail2.com/t/r-l-bidpik-jiwtdkhir-j/).